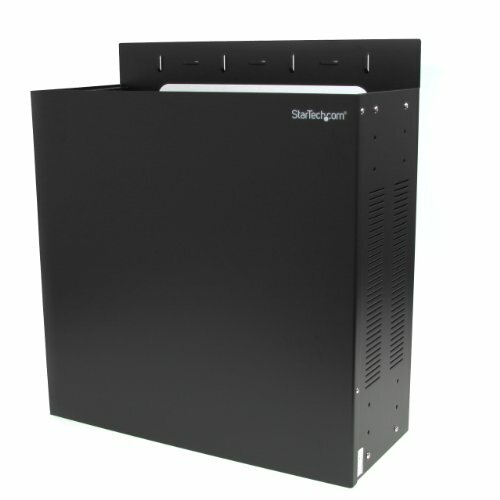 Wallmount your server or networking equipment horizontally or vertically in locations where space is at a premium - The RK419WALVO 4U 19-inch Steel Side Mount Rack is a Wall Mountable 4U solid steel rack, providing a robust solution for mounting your telecom, network or server equipment. This TAA compliant product adheres to the requirements of the US Federal Trade Agreements Act (TAA), allowing government GSA Schedule purchases. This server rack can be mounted in a server room, office, or above a doorway in rooms lacking the floor space for a full-size rack, expanding your workspace and keeping your equipment easily accessible. The rack is constructed to EIA-RS310 standards and allows equipment to be mounted vertically - non-rackmount equipment can be installed using the rack as a wall case. The bracket mounting holes (used to mount to a wall or the desk underside) are positioned at exactly 16-inches apart, matching standard construction stud measurements for easy installation. Backed by a StarTech.com Lifetime warranty.